Every Saturday or Sunday morning for the best part of seven years I would call Charles Brown in Oakland. The ostensible reason was to discuss reviews editing for Locus, something we did discuss. We would talk about events of interest in the field, books we were interested in, books he had that I’d not seen yet, and books that we loved. Again and again we’d circle around, discussing this and that: our mutual admiration for Citizen of the Galaxy, our love for the novels of Tim Powers, and many, many other things. 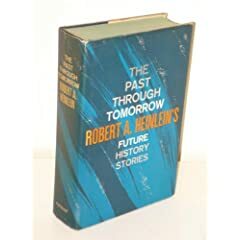 One book that came up again and again was The Past Through Tomorrow, which collects Robert A. Heinlein’s ‘Future History’ stories. It’s an essential book, a fascinating book, and one that we both loved. When I was in Oakland I’d amuse Charles by admiring this signed first edition, and bemoan the fact that I only have a dog-eared old NEL paperback of the book. I’d hoped that the Virginia Edition might offer some good options, but that doesn’t seem like a good option. And now I’m thinking, I just might have to fork over a couple hundred bucks and get myself a first edition. If there’s a copy in the World Fantasy dealer’s room, I just might come home significantly poorer. I think I might need it.